Just minutes south of the Langdale Ferry Terminal along Highway 101, the unique scenic seaside village of Gibsons acts as the gateway to the Sunshine Coast of British Columbia. The harbour is everything it should be, chock full of boats, with an atmosphere as thick as fog on a fall morning. Many generations before the arrival of the first European settlers, the Squamish First Nations people occupied a summer village just east of Gibsons harbour, near present-day Armours Beach. The location offered fresh water, a sheltered shoreline, and easy access to the sea. Captain George Vancouver sailed through this region in 1792, and came ashore with his party at Gower Point, a few kilometres west of Gibsons. Gibson’s Landing was established in 1886 when George Gibson’s boat blew off course and he and his two sons landed here by accident. Incorporated in 1929, local residents persuaded the Post Office in 1947 to drop the “Landing”, so today this lively waterfront community is known simply as Gibsons. In this unique setting on Howe Sound, surrounded by Mount Elphinstone to the north, Howe Sound to the east, and the Strait of Georgia on the southwest, you’ll experience the best of the Sunshine Coast lifestyle. 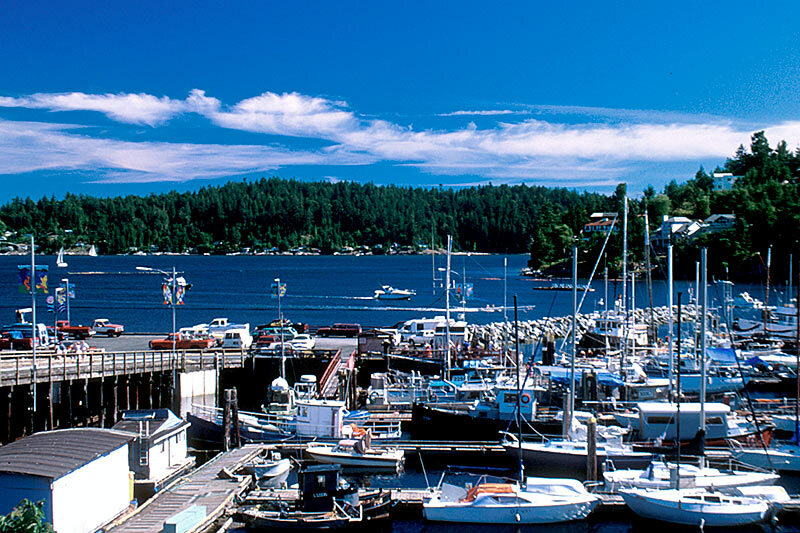 A mild west coast climate, breathtaking mountain-to-ocean scenery, and year-round outdoor recreational activities make Gibsons a rather special for the 4,000 permanent residents of the community. A variety of restaurants, bed and breakfasts, hotels, artists’ studios and other hospitality services welcome the visitor. Location: Gibsons is located on the north shore of Howe Sound, on the southeast coast of the Sechelt Peninsula, 3 miles (5 km) south of Langdale. Gibsons is connected to Vancouver by vehicle ferry from the Horseshoe Bay BC Ferry terminal on Vancouver’s North Shore to the BC Ferry Terminal at Langdale on the Sunshine Coast. Floatplanes also link Vancouver and Gibsons harbours. From 1971 to 1990, Gibsons was the setting for the internationally popular CBC television program The Beachcombers, and has not been slow to cash in on its fame. Molly’s Reach, once a TV soundstage, is now a real cafe. Treat yourself to a walking tour of the harbour. At times, you’ll find fresh seafood for sale right off the side of a working fisherman’s vessel moored at the government wharf. A stroll on the Seawalk will introduce you to both the commercial and the natural sides of the harbour, complete with barges, fishing boats, tugs and float planes. Explore Sunshine Coast history and Coast Salish culture at the Elphinstone Pioneer Museum, which serves the area from Port Mellon to Egmont, including Gibsons, Roberts Creek, Sechelt and Pender Harbour. Go back in time as you view artifacts used by the early settlers, cruise through the Maritime Room and view items from the steamships of old. Enjoy the famous Charles Bedford shell collection, the largest in B.C. and one of the largest in Canada. Located in Molly’s Lane in Gibsons, the Maritime Museum includes changing displays of historic sea going activities of the north west coast. See ship engines, detailed models, charts and maritime artifacts. The present meets the past at Gibsons Visitor Centre. Right beside the building’s entrance is the burial plot for George Gibson and his family. The bronze statue of Gibson, the first European settler in the Gibsons area, stands in Pioneer Park. Gibsons was a British naval officer who moved from Ontario to the area and claimed Gibsons Landing in 1886. 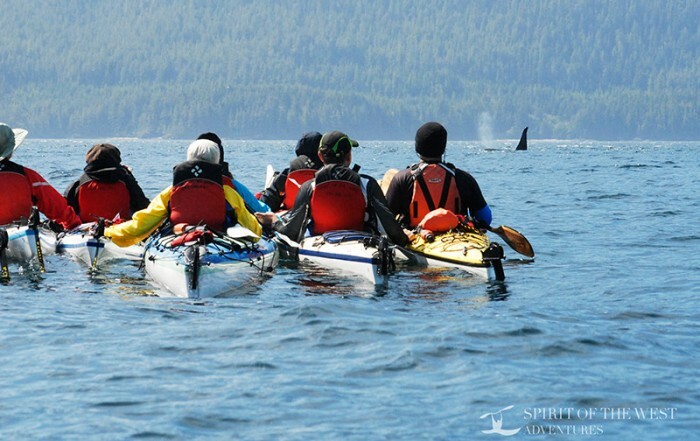 Events: Gibsons hosts a variety of special events, art workshops and cultural festivals; Jazz Festival, Fibre Arts Festival, Sea Cavalcade and Outrigger Canoe Races. The restored Heritage Theatre is the central gathering point for cultural activities of the Gibsons community. Beaches: Public beaches abound – sample the sand at Armours Beach, Georgia Beach, Pebbles Beach, Ocean Beach Esplanade and Chaster Provincial Park. Boat Launch: Gibsons offers boaters a public boat ramp for launching purposes. Golf: Golfers can head to the Sunshine Coast Golf and Country Club, on the north side of Highway 101 in Roberts Creek, a full 18-hole golf course that is open to the public. A little further north, the Sechelt Golf & Country Club is an 18-hole, Par 72 golf course (6,553 yards) located in the heart of the Sunshine Coast and open to the public every day for a memorable round of golf. Golfers will enjoy the generous fairways and large gently sloping greens. Golf Vacations in British Columbia. Cycling: Although shoulders on the winding highway can be narrow, cyclists will find that Highway 101 is a challenging but often scenic route. You don’t have to cycle Hwy 101 all the way, all the time. There are a few backroads, such as Lower Roberts Creek Road, that travel in roughly the same direction while providing a more tranquil ambience. Lower Roberts Creek Road loops away from Hwy 101 north of Gibsons and rejoins it north of Roberts Creek, for a total distance of 5 miles (8 km). Mountain Biking: The Sunshine Coast has a progressive attitude towards mountain biking, so it is no wonder that the region is a maze of mountain-bike paths. Sprockids Mountain Bike Park in Gibsons is designed with the younger generation in mind. Located at the north end of Stewart Road just off the Gibsons Bypass, the park provides almost 9 miles (14 km) of trails that will appeal to mountain bikers of all ages. North of Gibsons, the area around Roberts Creek is a great hangout for the serious mountain biker. Three major loop trails – Roberts Creek (18.5 miles/30 km), Clack Creek (7.5 miles/12 km), and the Brodie Race Trails (4.5 miles/7.5 km) – will wear the tread off any tire and introduce riders to shorter technical routes such as Three Steps, the Mexican Jumping Bean Trail, Black Tower, and Portage, all accessed from B&K Rd (Roberts Creek Forest Road), just east of Roberts Creek Provincial Park. All trails begin a short distance up the road at the BC Hydro power line. Each route is marked with a bike symbol and a different shade of paint. The Soames Hill Trail (moderate) between Gibsons and Langdale is Gibsons’ answer to North Vancouver’s Grouse Grind, a 40-minute stair-climb that seems to last forever, at the top of which you’re rewarded with a view that just won’t quit of Howe Sound, Keats Island, Gibsons and the Strait of Georgia. To reach the trailhead, take North or Reed Road to Chamberlain Road, then east on Bridgeman Road to its end. Much lengthier hiking trails in Gibsons can be found on Mount Elphinstone, which dominates the northwestern entrance to Howe Sound. The Mount Elphinstone Heritage Trails take advantage of numerous logging roads that had become overgrown when the timber supply was exhausted. All the trails are well marked with both colour-coded surveyor’s tape and metal disks. The K2 Trail (moderate) ascends the side of Mount Elphinstone (4,137 feet/1261 m) from the end of Wharf Road. To find the trailhead, follow the Port Mellon Hwy a short distance north of the ferry terminal at Langdale to Wharf Road. As the pink-taped K2 Trail ascends, it meets with the blue-taped Waterfall Trail (easy), a much shorter, lower-elevation hike that leads to a waterfall viewpoint on Langdale Creek. The trailhead for the Waterfall Trail begins at the north end of Stewart Road. Take either North Road or the Gibsons Bypass to reach Stewart Road. Red-taped Tramway Trail (moderate) follows the path of two tramways that once ferried supplies to loggers at higher elevations. The trailhead is located only after following several marked and unmarked roads. Take North Road from either Gibsons or Langdale to Cemetery Road, then follow Cemetery, which leads past a – you guessed it – cemetery, to Keith Road. Watch for a road opposite the Boothill Ranch, which will deposit you in front of a yellow gate. Hike a short distance from here to the trailhead, which is marked with a red aluminum tag. Mount Elphinstone Provincial Park: Three separate postage-stamp-size remnants of old-growth forest make up this 139-hectare park on the southwest slopes of Mount Elphinstone, near Roberts Creek. The park protects the area’s abundance and diversity of forest mushrooms. A prolific number of mushrooms grow here, some of which have yet to be properly identified. The three sites chosen for the park had the greatest diversity of fungi, and contain the rare Tricholoma apium and many other notable species of fungus. Tread carefully and take only photographs, as mushroom picking is prohibited in the park. Old wagon and jeep tracks have formed a network of mossy trails, allowing limited recreational use. There are no facilities at this park. To access the park turn right up Crow Road or the B&K Forest Service Road. Winter Activities: Dakota Ridge is popular for cross-country skiing, snowshoeing and tobogganing. Dakota Bowl is popular with more advanced skiers and has telemark routes on the north side of the bowl and spectacular views of Vancouver Island, North Shore mountains and Mt. Baker in Washington State. These are not well-developed areas so do not expect to find services such as equipment rentals, chairlifts or cafes. Shellfish: If you like to pick mussels and oysters and look for seashells, the beach at the Roberts Creek picnic grounds is a good place to visit at low tide. Just check for red-tide warnings and harvesting closures beforehand at the entrance to the park. 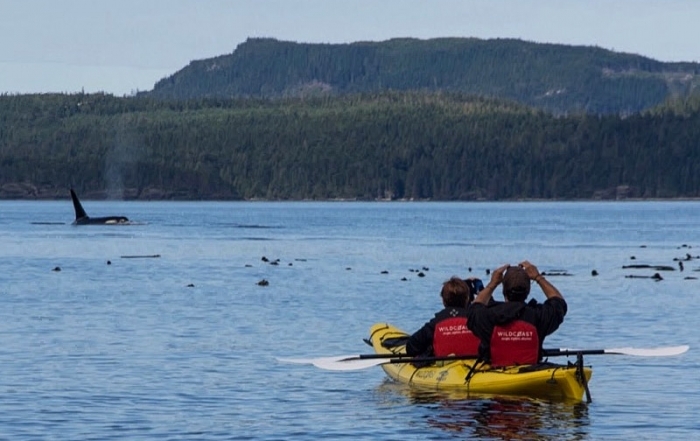 Plumper Cove Marine Provincial Park is one of the coast’s oldest marine parks and a very popular anchorage in the summer months. The 57-hectare park is located on the northwest shore of Keats Island, immediately across Howe Sound from the town of Gibsons. The park has a well maintained hiking trail system, a grassy upland picnic area and forested walk-in campsites toward Observatory Point. Hiking trails lead from the picnic area to Lookout Mountain and Stony Hill. The pebble beach is great for swimming and beachcombing. The park is accessible by foot passenger ferry from the Langdale Ferry Terminal, and by water taxi from Gibsons. Roberts Creek Provincial Park straddles Highway 101, about 6 miles (9 km) west of Gibsons, and offers vehicle/tent campsites. Lush second-growth forest is the setting for the park’s picnic grounds and beach, the entrance to which lies south of the campground on Elphinstone Road, where you’ll find two dozen tables arranged beside the ocean. Immediately north of Gibsons is the tiny village of Langdale, the ferry terminal linking Highway 99 at Horseshoe Bay (Vancouver) to Highway 101, the main route connecting communities on the Sechelt and Malaspina Peninsulas of the Sunshine Coast of BC.